Gloria has been a qualified solicitor since 1996. She is of Sri Lankan heritage and is bilingual in English and Mandarin languages. She is an advocate & solicitor, barrister, mediator, negotiator and collaborative practice lawyer. 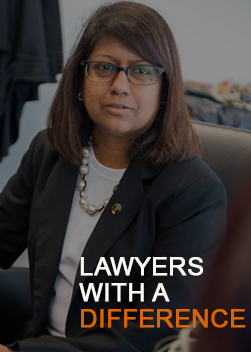 In the course of her 22-year legal career, she has gained considerable experience and knowledge in diverse areas of the law pertaining to Family Law, Criminal Law, Civil, Corporate & Commercial Law and Estate Law. She has acquired skill sets in Mediation, Collaborative Practice, Negotiations and Litigation. In 2014, Gloria attained certification in Mediating Disputes from the Harvard Mediation Program under the guidance of Professor Robert H. Mnookin, a leading scholar in the field of conflict resolution. She also trained with Regent’s University of London under the guidance of Paul Randolph and his team in the area of mediation coupled with psychotherapy and psychology. With this training, she is capable of managing high conflict personalities in an intensive, emotional and volatile background. She is also able to empathise with, and provide emotional support to clients. In 2015, Gloria underwent an intensive 40 hours Family Mediation Workshop jointly organized by the Singapore Mediation Centre and Erickson Mediation Institute. She passed the practical and written assessments and was accredited as a Family Mediator in the Singapore Mediation Centre and Family Justice Courts of Singapore. In August 2015, Gloria enrolled in a workshop course conducted by Dr Philip Stahl and the Family Justice Courts of Singapore. Upon successful completion of the workshop and practical assessment she was appointed as a Child Representative Lawyer by the Family Justice Courts. Being on the Panel of Child Representative Lawyers, Gloria is able to represent children’s welfare and best interests in heavily contested family court proceedings. In February 2016, Gloria enrolled in a workshop course conducted by Dr Debra Carter and the Family Justice Courts of Singapore. Upon successful completion of the workshop she qualified as a Parenting Coordinator. With this skill set Gloria helps parents to cooperate and resolve children’s issues which may arise during and post high-conflict divorce proceedings with heavily contested child custody issues. 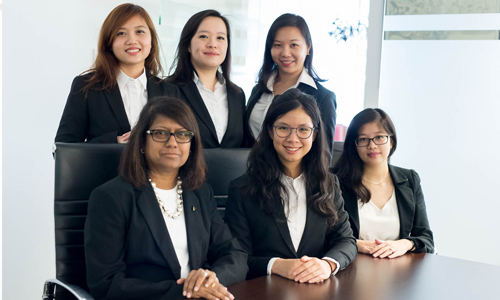 Gloria is one of the first batch of family lawyers in Singapore, who received specialist training in July 2013 by Ms Catherine Gale, and is qualified to practice Collaborative Family Law. She has presided over many collaborative divorce matters and matrimonial disputes to successful resolution. She is also a Member of the International Academy of Collaborative Practitioners. Being a successful negotiator, she is also able to resolve many high conflict matrimonial matters and civil disputes. It is all about saying the right thing at the appropriate time. Her skills in negotiations is instrumentally beneficial for her clients. Over a period of 22 years, Gloria has represented clients in the Civil, Criminal and Family Courts, from suits to appeal. 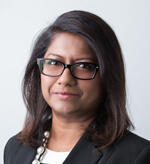 She constantly undergoes training workshops and attends seminars in order to ensure that she is updated with the ever-changing legal landscape. Gloria took up this 4 month course in January 2017, putting in 106 hours to complete the Foundation and Advanced Coaching courses conducted by an American licensed body. With this training, Gloria fulfilled her dream of becoming a ‘Lawyer with a Difference’. The reason she took this course is that there were many times she felt helpless and unable to assist a client sitting in front of her, who at that stage in their life, did not need a lawyer. This client required someone who would listen, support, and be there for him/her during the difficult journey that he/she had embarked upon, or was about to embark upon. By becoming a CDC Certified Divorce Coach, Gloria is now able to fulfill the gap in the client’s life and offer a more personal approach. She calls it the ‘missing link’ that will help her reach out to that client who needs a caring and understanding person like Gloria in their life. Gloria`s popular divorce blog, which explains the divorce process in Singapore in its entirety, has been a valuable source of information for couples or individuals wanting to find out more information about how the family law process works. In order to help the public, her law firm has also created the Maintenance Calculator and Property Division Apps that can be downloaded from Google Play and App stores. Gloria was in a team of five lawyers that conducted the Coroner’s Inquiry into the death of an American scientist (Shane Todd), a highly publicised international matter, in 2013. Gloria was also a part of a team that was involved with the Coroner’s Inquiry to determine the cause of death of an American citizen who fell from the Swiss hotel. Gloria is often quoted in the local newspapers; The Straits Times, The New Paper, Today, My Paper; and local magazines, Her World and Singapore’s Women’s Weekly. She has also appeared in televisions news ie Channel News Asia, Channel 5, BBC, and CBS 48hours. She also appeared in live tv talk shows.